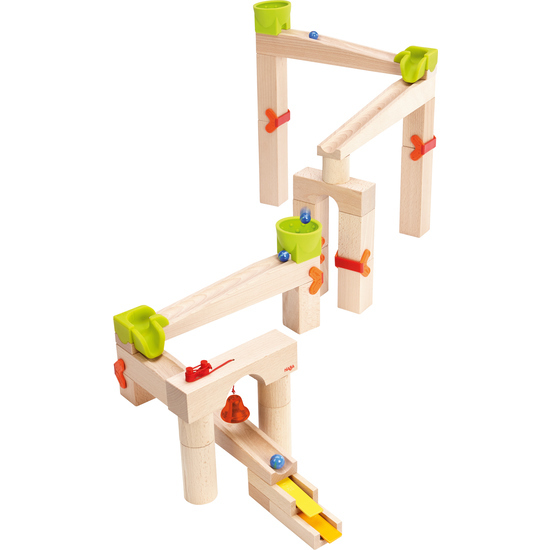 This ball track is quickly assembled, easily variated and combines fantastically. The speed curves are particularly exciting, building up excellent momentum until they fall into the speed breakers which slows them down for the next ramp. The resonating building blocks and bridge with bell can be inserted along the raceway or at the end of the track, to supply a ringing finale. Contents: 4 ramps, 1 square block, 9 rectangular blocks, 1 slat, 1 bridge, 5 columns, 1 bridge with bell, 2 resonating building blocks, 2 speed curves, 2 speed breaker, 6 building block clamps, 6 marbles.